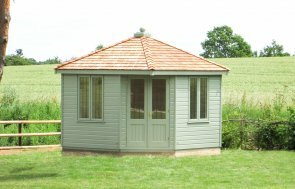 This Blakeney Summerhouse is 2.4 x 2.4m in size, and it is the simplest form of Blakeney we make. It has been installed in our customer’s garden in Gamston, Nottinghamshire, to use as a garden building to enjoy a bit of relaxation time in during the summer months. The customer is currently in the middle of redesigning their garden, and wanted to get the summerhouse in first. They only wanted the building in the standard Light Oak preservative, so they can think about what colour to paint it themselves once their garden has started to take shape and they can see what colour may suit. 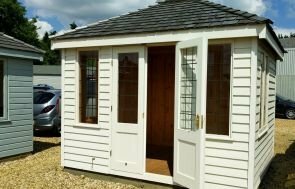 Our Blakeney and Morston Summerhouses are the two summerhouses we make that you can have as simple or as stylised as you would like. 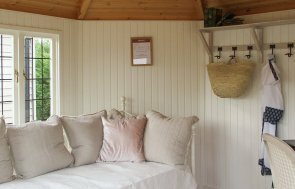 I just wanted to let you know that we have been delighted with our Blakeney Summerhouse and it is getting a lot of use despite the appalling weather we have had since it went up on 13th June. The specification we eventually worked out with your help is exactly what we wanted and fits the site perfectly. Communication with the factory worked well and the team who came to install it did a very professional job. We will have no hesitation in recommending Crane to our friends. This customer has chosen to have the building in its simplest form with heavy duty felt on the roof, and no lining or insulation on the inside. This suits them perfectly though, as they will only be using the summerhouse in the summer months, and don’t need to worry about prolonged usage. The doors can be hooked open and there is a single opening window on the right-hand side of the Blakeney to get air flow through on hotter days. If you like the look of our Blakeney Summerhouse, you can create your own design using our Online Garden Building Planner Tool, or if you have any questions, you can call us on 01760 444229 or send us an online enquiry and we’ll be able to help with your queries.